What are the differences between the educational achievements of Arab Israeli and Jewish students in Israel? Many educational research studies have explored this question in the past and pointed to disparities between the two sectors. However, Researcher Nachum Blass finds that there has been significant improvement in the achievements of Arab Israeli students in recent years and that the gaps between students in the Arab and Hebrew education systems have narrowed. In particular, when comparing students of similar socioeconomic backgrounds, the achievements of students in the Arab education system have improved considerably over the years, approaching those of students in the Hebrew education system – and even surpassing them in some areas. To compare the two streams, it is important to look both at resources allocated to each stream and at educational outcomes – that is, the achievements of the students. Considerable disparities remain in budget per student in the Arab education system and the Hebrew education system. While NIS 20,000 was allocated per primary school student in the Hebrew education stream in 2015, only about NIS 16,000 was allocated for a primary school student in the Arab education stream in the same year. Nonetheless, the per student budget has increased more rapidly over time in Arab education than in Hebrew education. In educational research, teachers’ qualifications are often indicated by teachers’ level of education. The share of teachers with an academic degree in the Arab education system actually exceeds the share in the Hebrew education system at every level of education. For example, 95% of teachers in early childhood education in the Arab education system have an academic degree versus 91% in Hebrew education. In addition, the share of teachers with a Master’s degree is growing and approaching that of teachers in Hebrew education, even though in post-primary education there are still notable gaps between the education streams in this regard. Though the Ministry of Education’s efforts to reduce the size of classes did not bring about considerable change in the Hebrew education system, the results were more impressive in Arab education. By 2015, the number of students per class in Arab primary and middle schools was lower than in the Hebrew education system, and only in high school was it higher. More Arab Israeli students are enrolled in school and higher education, and their scholastic achievements have risen in a number of subjects. However, large scholastic achievements gaps remain between the streams, both on national and international exam scores. Enrollment rates in Arab primary and middle schools have risen from 63% in 1990 to 93% in 2015, whereas there was already 90% enrollment in the Hebrew education stream in 1990, which has since increased to 97%. Particularly striking is the rise in enrollment among girls in the Arab education system: from 59% to 94% during this period. In addition, there was an increase in the percentage of Arab Israelis admitted to higher education institutions within Israel and in the share of all degree holders in Israel who are Arab Israeli. Despite this progress, it is important to note that in 2015 a much smaller percentage of Arab Israeli young adults (25-34) had more than 13 years of schooling than among Jews: only 36% as compared with 72%. In terms of achievements, there was a substantial increase in math scores between 2007 and 2016 and a moderate increase in English scores among Arabic speakers on the fifth grade Meitzav exams, which narrowed the gaps between the two education streams in these subjects. On the eighth grade test the gap in scores narrowed in science and technology during the same period, but the gap in math scores increased, and the gap in English remained unchanged. Classifying students into three socioeconomic groups, and comparing between students of similar socioeconomic background, cuts the gap in English scores between Hebrew- and Arabic-speaking students in about half. These gaps might be even smaller if students’ achievements were analyzed after an even more nuanced division into ten socioeconomic groups. 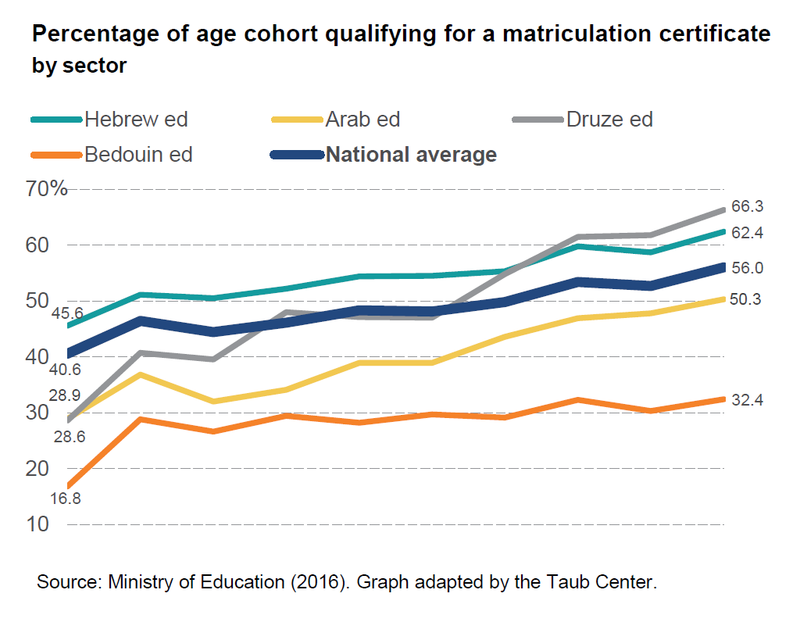 The share of those taking the matriculation exams in the Arab education stream is similar to that in the Hebrew stream, and the gap between Jewish and Arab Israeli students in the percentage who qualify for a matriculation certificate out of those who took the exams has dropped from 17% in 2000 to 12% in 2015. While there have been some improvements on the math, chemistry, and biology matriculation exams for Arab Israeli students, the success gaps are still large on the 5-unit level of the English matriculation exams: in the Hebrew education stream 58% pass the exams, in the Arab education stream – 14%, and in the Druze stream – 25%. In contrast to the achievements mentioned above, the gaps between students in the two education streams have narrowed to a lesser degree on international exams, and in some cases have remained unchanged – even among students from similar socioeconomic backgrounds. On the 2011 PIRLS exam (primary school), there was a correlation between stronger socioeconomic background and higher exam scores, and the gaps showing an advantage for Jewish students did not narrow when classifying students by socioeconomic groups. A similar relationship between exam scores and socioeconomic background is also found on the 2015 TIMSS exam (middle school) but, when comparing students of the same socioeconomic background, the gap between the average math score in each stream became much smaller. This may show that at least some of the gap in math scores between the two streams are rooted in the students’ socioeconomic backgrounds. On the 2015 PISA exam (high school), however, the overall gap between the streams mostly remains even when students were classified by socioeconomic background. Despite the educational disparities between the Hebrew and Arab education systems in certain areas, the scholastic achievements of Arab Israeli students have greatly improved. The gaps appear to be even smaller when comparing students of similar socioeconomic standing, which shows that the large gap in achievement between Jewish students and Arab Israeli students can be explained to a great extent by their socioeconomic backgrounds. If we want to reduce this gap, we should focus more generally on addressing socioeconomic issues between the two sectors.